Within the metropolitan Atlanta area, the Stone Mountain Historic District is a rare surviving historic railroad town. This intact community contains nearly every major element of a railroad town in Georgia, including the homes of the town founders, the rail line, central business district, residential neighborhoods, and community landmark buildings. These collectively represent nearly a century and half of local growth and development. The town is located at the base of Stone Mountain, a granite outcropping that rises 700 feet above the surrounding terrain and 1,683 feet above sea level. Although the mountain is not included with the district boundaries, it is visible from points throughout the town and is a key component of the setting of the historic district. Granite from the mountain was relied on as a major construction material for the city. The historic district comprises residential, commercial, and community landmark buildings constructed from the 1830s through 1950, and includes a variety of architectural styles and building types. 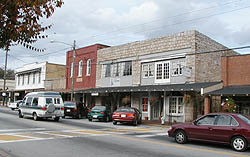 The Georgia Railroad line runs north to south through the center of the historic district. The commercial area at the center of the district consists mostly of a continuous row of one- and two-story commercial buildings on the east side of Main Street, opposite the rail line. The commercial buildings, largely built from granite or brick, include filling stations, arcaded blocks and commercial blocks. The historic houses are prevalently bungalows with Craftsman style ornament and English Vernacular Revival style houses built mostly in the first decades of the 20th century. Twelve buildings, constructed as residences, are now serving commercial functions. Residential buildings constructed in the earlier decades of the 19th century were built in the Greek Revival style. The second half of that century saw less ornate architectural styles. Houses from this period may be characterized as Folk Victorian. Craftsman style houses were built throughout Stone Mountain from the late 19th century to the first decades of the 20th century. Elements of the Craftsman style are exposed rafter ends, porches supported by massive wood supports or brick piers, decorative brackets and windows organized in pairs and bands. Shermantown, located south of downtown, is a historically black neighborhood within the district. Shermantown features small frame houses on small lots, narrow streets and community landmarks such as churches and stores. Of particular distinction is the Rock Gym, a granite gymnasium that was built by the Works Progress Administration c. 1930. It features granite buttresses and sills and an open truss roof. Its open plan remains intact and the building now serves as a recreation center. Stone Mountain Historic District is located in east central DeKalb County, 10 miles east of Atlanta on route 10. The district is roughly bounded by Stone Mountain Cemetery, Stone Mountain Memorial Park, Lucile St., CSX Railroad, VFW Dr., and the city limits. It contains several commercial shops which are open to the public during normal business hours, and many private residences which are not open to the public. 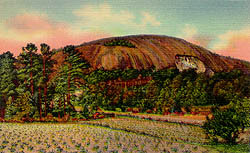 Stone Mountain Park is not within the historic district, but is located adjacent to the town. For more information on Stone Mountain Park visit their website.